Opening the envelope is always a treat when ‘Murky Depths’ arrives. I sat for several minutes just inhaling the odour. The fabulous wraparound cover by Leonardo M Giron takes several minutes of looking to pick out all the detail he’s crammed in. 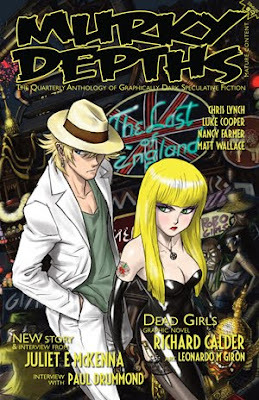 The art is based on Richard Calder’s graphic novel ‘Dead Girls’, which features in a couple of articles too, before we’re treated to the opening chapter of the novel. The artwork for the comic, again by Leonardo M Giron, is beautifully drawn and highly evocative, the characters’ expressions and attitudes captured with remarkable realism. I'd just like to thank you for your review of my story "March of the Broken". I'm very proud of how it looks in the pages of Murky Depths #9, and your review is the first one I've had.